Pain Physicians NY (Brooklyn, Queens, Manhattan, Bronx NYC) is one of the first practices in New York to offer an alternative treatment for arm and hand pain. Depending on severity of the pain, signs and symptoms in addition to traditional treatment options such as muscle relaxants, injections or physical therapy we might offer a cutting edge, non-invasive disc decompression procedure, Platelet Rich Plasma (PRP) injections, Interstitial Laser Therapy, Pulse Stimulation Treatment and Electrical Nerve Stimulation. 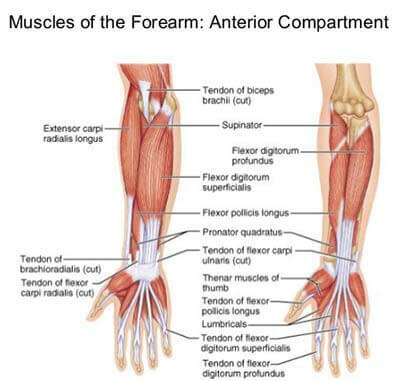 The arm muscles are among the most commonly used muscles in the body, allowing us to do most activities. All these actions are facilitated by the shoulder muscles, across where the sensory and motor nerves from the neck pass. It would make sense, therefore, that a problem affecting the shoulder would subsequently affect the arm and hands, and it does. The Cervical Radiculopathy is when the discs surrounding the cervical vertebrae in the neck become worn off, the vertebrae eventually lie awkwardly on top of one another. Suppose one of these vertebrae sat on a nerve that supplies sensation to the shoulder and arms, then this would cause pain to radiate along the entire arm from the shoulder to the hand. The Rotator Cuff is a set of muscles and ligaments that provide support to the shoulder and keep it attached to the shoulder blade. This kind of injury is often due to direct trauma on this region that causes pain primarily in the shoulder that may extend down to the arms and hands. Besides trauma, chronic overuse of the muscle as well as ageing can cause the rotator cuff to become damaged and become painful. Sometimes a heart attack may present with a severe pain radiating from the chest and spreading to the arm, often on the left side. It is not known why this happens, but a sudden pain on the left arm and hand can be a sign of a heart attack. Certain accidents, such as a direct fall as a result of sports injury, work injury on one hand at an angle may remove the humeral head from the scapula, preventing the arm from movement. This event is always followed by intense radiating pain from the shoulder down to the arm and hands due to the pressing of the bone to the nerves. Dislocations can be solved by manually pushing the joint back into place and resting the joint. Surgery is the last treatment option when other treatment methods have failed to relieve the signs and symptoms of Arm and Hand Pain. The most advanced pain management center, Brooklyn pain management doctors and specialists at Pain Physicians NY offer unique, individualized approach to manage your Arm and Hand Pain. We are using the most effective pain management and treatment options to treat arm and hand pain, different forms of arthritis, trigger finger or thumb. We are utilizing the latest technologies available in USA.